It's hard to figure what the thinking was behind Stormwatch Vol. 4: Reset. Certainly writer Jim Starlin is a comics legend, and I have liked artist Yvel Guichet in partnership, for instance, with Doug Mahnke on JLA: The Obsidian Age. But Starlin's dialogue and plotting were short of modern standards even in Death of the New Gods, and the plain style Guichet uses here makes the book unlikely to jump off the shelves. The endeavor seems almost a farce, with the return to the 1990s Stormwatch logo and the use of that era's Lobo, except the book never gives a sense of satire. If anything, Reset embraces the '90s with characters named Mordak, Extremax, and the Kollective in such a way as to suggest the creative team thinks '90s sensibilities are where readers are, and that's disturbing. I've seen better-attuned teams cancelled much more quickly, and it's astounding Starlin's run lasted ten issues (mercifully, at least, collected all in one volume instead of being split into two). All of that said, by some miracle this book goes from ridiculous to dull to actually kind of sweet and engaging for a couple pages in the end; possibly after you travel ten issues with any group of characters, maybe you get a little attached to them. And then the book finishes with a dynamite eleventh issue by Sterling Gates and Jeremy Roberts, for which I know I'm not the only person asking why DC didn't give this book to them from the outset. Reset is bizarre and half-baked, but it will certainly leave you with enthusiasm for reading some Stormwatch done right. Again, "the good" comes in about the last four chapters of Reset, about the time the characters learn a technician for the book's alt-history Stormwatch has been selling secrets to Martian Manhunter J'onn J'onzz. Leaving aside how little sense that makes continuity-wise, J'onn's involvement deepens the mystery of character Storm Control's identity, plus the resulting cameos are just fun. Reset is a book that plays out largely as one might expect, and tying in the Justice League is an unexpected twist that gives the end a needed bit of gusto. As well, Starlin wrings some unexpected emotion from the ultimate friendship between alien warlord Extremax and the book's "century baby" Jenny Soul. Extremax is a typical all-powerful alien bad guy in the style of Starlin's Mongul or Thanos (it's unintentionally hilarious that "Extremax" is the character's given name, even when he was a lowly slave) and he seems set to be the book's main villain; Soul is written as over-emotive and annoying, more like Wesley Crusher than Jennys Sparks or Quantum. The two must partner in the end against the also-villainous Kollective, however, and then Extremax finds only Jenny can utilize his long-sought source of power. A mentoring relationship forms, and the interplay between the two is suddenly charming. Though this book is mostly chaos, Starlin hits a vein of something here, perhaps in simply writing two characters' dialogue without all the trappings of the rest of the book. If Extremax is specifically supposed to be a Thanos analogue, then maybe Jenny Soul is equally someone else and I'm just not getting the context (maybe Starlin's entire Stormwatch is Marvel in the DCU or something, for all I know), but the way in which the characters defy expectations equally brightens the end of the book. And it's possible the book's longevity helps everything; though characters Hellstrike and Xiomar are each in their own way problematic, the scene in the penultimate issue when they reconcile Hellstrike's role in murdering Xiomar's family is also surprisingly emotional after spending so much time with the characters. But absolutely none of this is to suggest that Reset is at this level all the way through. I have read worse, and books less respectful of their characters, but Reset is a lot of Stormwatch fighting nameless aliens and spouting vapid dialogue. A character describes Midnighter, for instance, as being violent like a "bag o' monkeys," whatever that means; another character warns of the bad guys' "lumbering goons." Starlin writes Xiomar with a hackneyed pseudo-African accent, calling Storm Control "baas" for "boss" and dropping his "am" in "when I agitated." It's all so out of step that Starlin even takes a swipe at George W. Bush some ten years after the joke might be funny, and has a character refer to Midnighter and Apollo as "alternative lifestyle types," which would be offensive if it wasn't so tin-eared. Guichet draws Hellstrike in a shirtless vest and pants the whole time, as if the character were transported whole cloth straight from the 1990s Stormwatch series. Plenty of times Starlin's words describe the same thing as in Guichet's pictures, and also occasionally characters speak dialogue to someone behind them, especially in crowd sequences. For these reasons, Gates and Roberts's final issue is almost shocking in its prowess -- clearly someone out there knew what would succeed in the Stormwatch title, so it's astounding it wasn't used the whole time. In the opening sequence presenting the Authority's Carrier, Gates even takes the book places that Paul Cornell and Peter Milligan didn't previously. The issue's focus is on the teenage Jenny Quantum, told in a voice akin to Gates's Supergirl, and it works; I'd happily read a Sterling Gates-penned Jenny Quantum series. Roberts's panels get a bit crowded at time with narration boxes and word balloons -- perhaps not the artist's fault -- but he's got a detailed style reminiscent of Jim Lee, David Finch, or Jason Fabok, and it's not surprising DC put him on the high-profile New Suicide Squad book. Sterling Gates's Authority-esque "We warned you first" ending to his Stormwatch issue is the concluding note this title should have begun on; certainly it makes me wish there was another trade by this team to follow. It's unfortunate the New 52 Stormwatch never reached Authority caliber, and that it had to reach this real nadir before it started looking up. 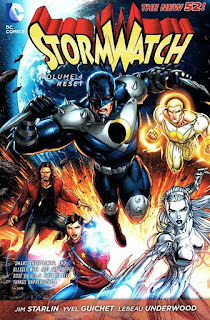 Stormwatch Vol. 4: Reset, inasmuch as it itself is affected by its own "reset," seems the height of skip-able; it's not all bad, but surely there's plenty better out there. Guichet's ugly, sloppy artwork bothered me a lot more than Starlin's outdated writing, which was at least offbeat enough to keep me interested. And the final issue by Gates is another example of what an expert he is at fixing characters, which is what he did for Supergirl and Prometheus. I wish he were writing one of the Rebirth ongoings. And, agreed with shagamu above about Sterling Gates -- an excellent character-fixer. His Supergirl was fantastic, and that Prometheus one-shot bringing the "real" character back was much better than the miniseries that followed. I hope he gets a new ongoing series in DC Rebirth at some point.